On route we visited the amazing Dambulla Golden Cave Temple. At the start of the steps going up to this cave temple is a new temple built by the Japanese with a large golden Buddha image. On the left of the temple, the start of many steps upwards to the cave temple. The climb is not as steep or hard as the Sigiriya Rock. 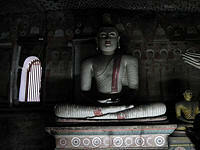 There are five separate caves containing about 150 Buddha images. There are large and small figures, seated standing and reclining Buddhas. The caves are dark with very little sunlight coming in through small windows adding to the spiritual atmosphere. Afterwards we drove on to Kandy and checked in at the Mahaweli Reach hotel. This is the hotel that we use in our deluxe category in Kandy and it is situated along the Mahaweli River. A large, well-managed hotel, if a little old-fashioned (in a good way), it offers excellent service and a good range of facilites. The rooms are large and comfortable and the swimming pool is a delight amidst the green lawns and gardens with view of the river beyond. Like the Cinnamon Lodge some of the restaurant tables are set out on the patio next to the garden and swimming pool. Again like Cinnamon Lodge, it is very pleasant to choose these outdoor tables for our breakfast and dinner there. Before our dinner tonight we went into the central part of Kandy for a culture show of Sri Lankan traditional dances. These are popular local culture shows for visitors performed by local boys and girls. The music and the dances are enjoyable and very entertaining but do not miss the last part outside the hall in the courtyard where fire dances are performed. 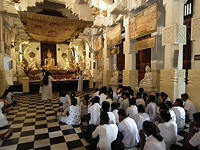 Our tour of Kandy next day started with a visit to the Temple of the Sacred Tooth Relic. 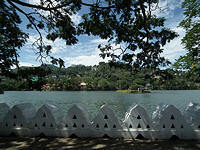 This lovely white building situated by Kandy Lake is also regularly visited by local people as it is a very sacred place. We were there that morning during the offering period with hundreds of local people queuing inside and outside the temple waiting for the opening of the small room that houses the tooth of the Buddha. The devotees and worshippers brought along beautiful flowers, fruits and food as well as their prayers to the temple. Instead of walking out the same way we walked out from the back entrance of the temple compound to the the lake walk with a most pleasant view of the Kandy Lake. At the end of this walk we came to a square and opposite us was a wonderful looking colonial style white building, the Queens Hotel, standing commandingly at the corner facing the temple and the lake. It is a fantastic location and full of history too. We decided to go in for an inspection to see if we can use this hotel for our clients. The hotel still posesses the charming old décor from its bygone years. The feel of history still lingers on to this day. The rooms are large and well presented. There is also a swimming pool in the gardens. We can use Queens Hotel for anyone who likes historic and colonial period hotels in the superior hotels category. 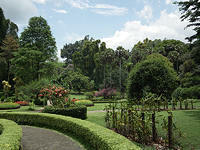 The Kandy Botanic Gardens is a lovely way to spend an hour or two. This beautiful park is full of trees, landscape gardens, herb gardens, bamboo collections, flower gardens and its famous orchid house. It is a good retreat from the busy traffic and people outside in the city. We stopped for a cup of local tea at the park café in front of Great Lawn with the most famous trees in the park, the Java Williow and the Cooks Pines that line the avenue along the river. An inspection tour of 2 hotels that we are using in our superior hotels category in Kandy was up next. The first was the Amaya Hills. We have not used this hotel before but wanted to see if we can use it for our clients in future. The hotel is large and high up on the hill with spectacular views of the city and beyond. The rooms are large with good views of the mountains. Nearby, the Randolee Hotel is not quite so high as the Amaya Hills but also offers fantastic views of mountains, the city and surrounding countryside. The garden is lovely with trees and lawn surrounding the swimming pool. 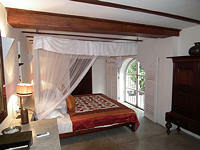 The rooms are decorated in local style and all offer great views. A visit to a special type of accommodation came next, a place that we regard as one of the best we have come across in Sri Lanka, The Kandy House. A beautifully restored courtyard villa dating back almost two centuries when it was built by the cheif minister of the last Kandyan king. It is now a boutique hotel decorated with antiques. Each room is individually designed and decorated elegantly. The beautiful inner courtyard is very private and refreshingly reminded me of a Chinese ancient house. The garden is well kept with lovely flowers and greenery. The dining area is on a patio stepping down to a perfect green lawn. Further down a few steps is the secluded private swimming pool surrounded by trees. This is a hidden treasure that I am glad that we have found. We are going to use this hotel for our future tours and is especially highly recommended for any honeymoon couple. We left Kandy and drove to Nuwara Eliya.